One of my favorite things about Thanksgiving week is that it falls toward the end of deer season. Where I live in Orange County, most of the guys I know are avid rifle hunters — many of them bring home a buck or two every year. When the new animal comes in, it means cleaning out the freezer to make room for the fresh meat. More often than not, hunters give packages left over from last season's hunt to friends and neighbors. So, whether or not someone in your household got lucky in the woods this fall, there's always lots of wild meat to go around. This time of year is also when the late fall oyster mushrooms really blossom. They form massive white columns on the sides of hardwoods, sometimes three or four feet high. In town or along the roads, you can spot them from far away, and it's easy to harvest several pounds while still leaving plenty on the tree. Wild mushroom foraging is tricky, and if you're not comfortable picking fungus from trees, several local farmers sell oyster mushrooms at farmers markets and co-ops. What's more, most big grocery stores sell them alongside shiitake, maitake and other gourmet fungus. And if you don't have a friend handing out packages of venison, ask your local butcher — Vermont is home to several deer farms, and it's not uncommon to find venison at the meat counter if you keep an eye out for it. *For a good baseline dry rub, raid your spice cabinet for coarse-grain sea salt, fresh-cracked pepper, and dried flakes of chile, garlic, onion and whatever other herbs and spices you like on your meat. (I'm fond of coriander, dill and fennel seed, but for a darker flavor you could use smoked paprika, garam masala or even a touch of allspice.) Mix two or three teaspoons salt, plus one teaspoon of all the others in a bowl and place in a spice jar for repeated use. Place the steak on a plate and dust generously with dry rub on both sides. Set aside. Wash the mushrooms (if they're larger than two inches in diameter, cut them to two-inch pieces) and place in a bowl. Sprinkle with salt and annatto, then with vinegar (1/2 teaspoon or less) and beer or wine (a couple tablespoons) and toss until the seasonings are well distributed. Warm the oil in a large skillet over medium heat. Add the garlic and onion and sauté until fragrant, 2-3 minutes. Spread the mushrooms in the pan in a single layer. Cook for several minutes, then turn one over with a fork; if it has begun to brown, turn the rest over. Repeat until the mushrooms are well browned but not blackened in the least — about 20 minutes. If it's happening faster than that, turn down the heat, as you want the mushrooms to cook long enough to tenderize. Move the mushrooms to the pan's periphery and increase heat to high. If the pan is dry, add another teaspoon of oil so the meat doesn't stick. Venison is very lean, so you can't count on its natural fat for lubricant. Place the steaks in the pan. For whole steaks, cook 2-3 minutes on each side, until medium rare, or longer, to your desired temperature. Keep an eye on the mushrooms so they don't burn. Steaks pre-sliced to half an inch or so will reach mid-rare with the quickest sear — one minute or less per side, depending on how hot your skillet is. 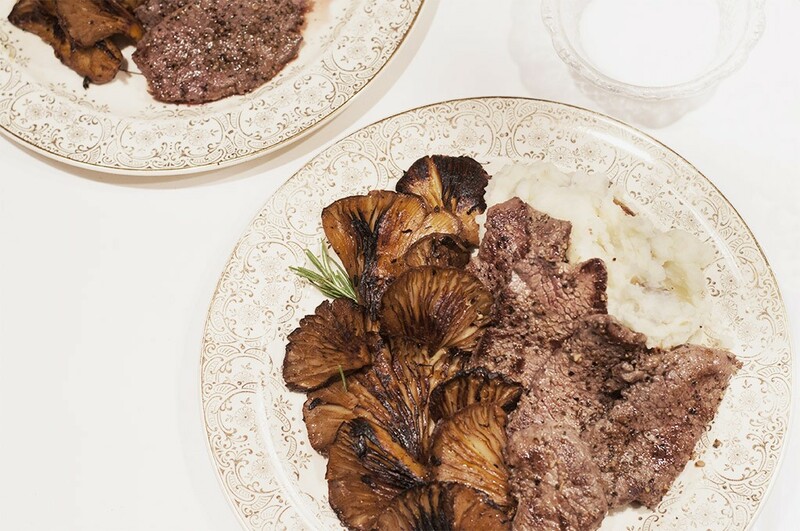 Plate the meat with the mushrooms (and mashed or roasted potatoes) and eat straight away.